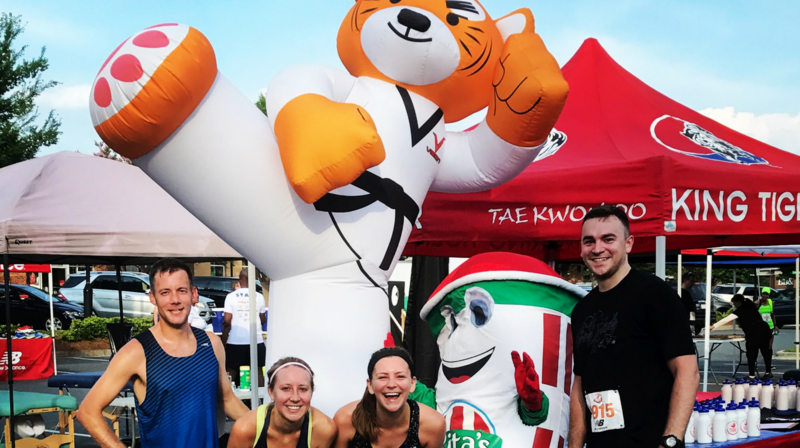 The 16th annual King Tiger 5K at University City will again take you through the heart of University City and end with great food, drinks, and music for all ages. We will also have a 1K Tiger Trot for kids as well as a Team Challenge. Put a group of 4 runners together and receive a team time to challenge your friends and compete for awards. Teams can be male, female or mixed. You can join an existing team or create your own. Team Challenge details are listed on the registration page. This event is part of the Healthy UCity Race Series. Mail – Check only: Mail an application with full entry fee, postmarked by Sunday, May 26 to: Event Marketing Services, Inc. Attn: King Tiger 5K 901 S. Kings Drive, Suite 100, Charlotte, NC 28204 Make all checks payable to Event Marketing Services, Inc. The YMCA is an association of men, women, and children joined together by a shared commitment to strengthen our community. Our programs and services nurture the potential of kids, provide healthy living and foster a sense of social responsibility. The Keith Family YMCA offers a fun, safe environment to 300 kids each in summer camp and another 100 during the hours of after school where they engage scholarships through YMCA financial assistance. By supporting the Y and King Tiger 5K, you are helping to develop the potential of our children and teens! Head to the University area with us to celebrate a beautiful summer Saturday! The King Tiger 5K will be heading back to the same course as our 2018 event starting and finishing at our University Run For Your Life shop! Take the the first two miles easy with a nice flat, downhill section. Save your legs for the uphill portion just after mile two and then reward yourself the last half mile with with a nice down hill finish! Free Rita’s Ice when you finish. No better way to cool off in June! Post race snacks provided by Trader Joe’s, Great Harvest Bread Co., and Hickory Tavern. The street address for the race is 1816 E. Arbors Dr.
All kids that participate in the 1K Tiger Trot will receive a prize! Awards will be presented at awards ceremony and will not be mailed. Awards will be kept for 2 weeks at the University Run For Your Life location. ^Age Groups: 14 & Under, 15-19, 20-24, 25-29, 30-34, 35-39, 40-44, 45-49, 50-54, 55-59, 60-64, 65-69, 70 & Up. Packet pick-up will be available on Thursday, May 30 and Friday, May 31 at all Run For Your Life locations. Packet pick-up will also be available on site race day. The Tiger Trot is a 1 kilometer fun run, that will start and finish at the same spot as the 5K. There will be race day registration available for the Trot. Please be at the finish line, with your child, by 8:05 AM. A member from the race team will give the children instructions and lead them to the start line for the Trot.